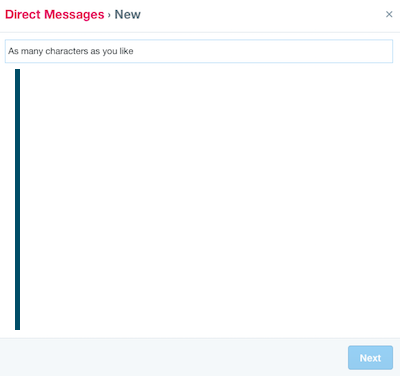 Twitter’s latest change to Direct Messages (removing the 140 character limit) may seem like a simple enhancement, but it should be triggering a number of important considerations for how brands use the platform for customer service. … (2/2) which previously had to be split across multiple tweets. Operationally this should be another entry on the “PROs list” for setting up your customer service function to deal with queries Twitter, rather than pushing them away to another medium like email. Format of their tweets. It’s all good stuff to stand out from the crowd. We all know that the less words you have to communicate something, the more thought you have to put into it – and in the world of 140-characters every word needs careful consideration. With this limit gone, the temptation will be for customer service responses to gradually increase in length and change in tone. Sure, a 280 or even 560 character response is fine. But will we start to see longer form responses with unnecessary, jargon-heavy copy, which don’t cut to the chase. More importantly, will we see brands simply re-using their “email template” approach, losing their personable, concise tone. The change doesn’t kick in until July, so we’ll see what happens.